A few years ago I was playing around with the Infocom Interpreter, trying to make it compatible with the F18A 80 column mode. In the original 80 column interpreter, the pattern descriptor table was relocated to VRAM bank #1, something that only exists with a V9938 configuration. The attached disk contains a version of the interpreter (ZORKF18A) modified to work within the constraints of the original 16K of VRAM. I have tested the program with both Classic99 and js99er. I do not currently have my F18A system up and running, so it would be helpful if someone would give this a whirl on the real hardware. Thanks to Shift838 for his help gathering the missing details to make this possible. If successful, I will update the other interpreter(s) that are needed for the ported games. ** EDITED ** Due to due early morning user haste of using the LOAD program instead of the correct E/A5 file. Refer to << MESSAGE 10 >> for proper results. Edited by --- Ω ---, Sun Apr 8, 2018 5:20 PM. Did you run E/A#5 ZORKF18A? I just dumped everything on the TIPI and ran the autoload. I'll do that when I get home from work. I was in a rush this morning. The disk contains multiple interpreters. I didn't mess with the autoload or remove the other interpreters but I suppose the XB loader could be updated. Run ZORKF18A from DSK1. using an EA5 loader. Edited by InsaneMultitasker, Sun Apr 8, 2018 1:04 PM. Does it run with a CALL TIPI loader as well? I'll grab your loader later and test it on my system. I have some thoughts about updating the way the DSR works in the Infocom loader but that may be more than I am willing (and able) to chew on right now. I identified what to change, but recompiling introduces some challenges to the interpreter memory map and the save/restore game code. The first time I tested it after I got home I used DM2K, but after reading your message I used the TIPI loader from BASIC. CALL TIPI ("TIPI.GAMES.ZORKF18A") and it worked just fine. Can you make the text GREEN on BLACK? The first time I tested it after II got home I used DM2K, but after reading your message I used the TIPI loader from BASIC. Not really offtopic: I found an Infocom app for Android. 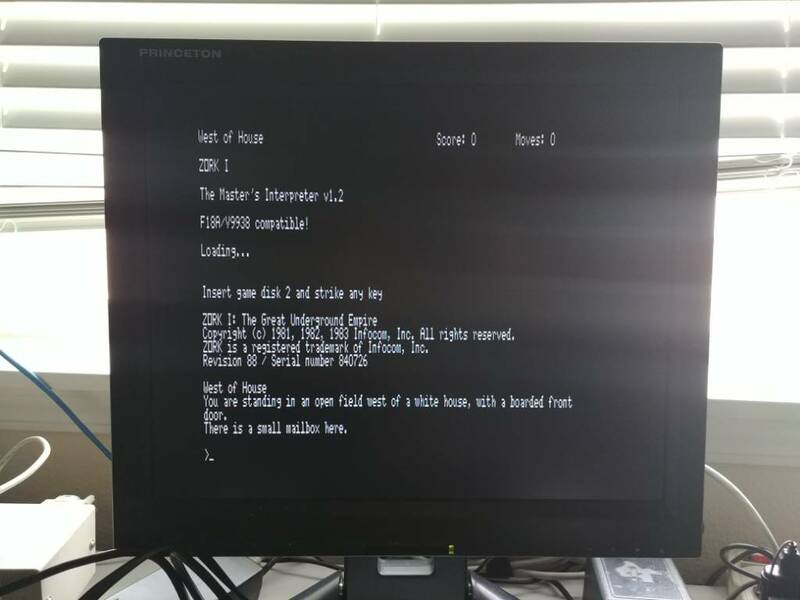 Is there an easy way to copy an Infocom game to a loadable file that can be fed to a Z-code interpreter? I suppose the BOOT1, BOOT2 files are the interpreter and GAME1, GAME2 are the Z-code files. If someone wants to share or create a simple, relocatable assembly routine (with source) that will allow a user to use the default or select the foreground/background colors they desire, and confirm they picked the right combination, I'll graft it into the Infocom Interpreter's startup routine. For F18A users, only a foreground/background selection is needed. V9938 users would have/need the option of selecting the highlight foreground/background colors. If you want to change the current colors sector edit ZORKF18B and find string "F087 0684". The "F0" represents the foreground and background colors. Currently, "F" is white. 2,3, or C for med, light, or dark green. ie, "2087 0684" would be med. green on black (transparent). Thanks! I'll give this a shot in the next couple of days, right now a have other things at the top of my "to do list. This is all the info I have. The file record counts will obviously differ for each game. I don't know what information is discarded by line 125, perhaps another interpreter+game file was used for the conversion to the TI files. 200 PRINT #2:C$ :: C$=""
Does anyone have an 80 column version of the Supercart interpreter v1.2? It is needed for games like Leather Goddess of Phobos and Moonmist. I figured... what the heck, it'll only take a minute. The disks with that information are from 2000 and do not have the original file dumps. No idea what version they came from as I didn't perform the dumps. Sorry. Now I might have some dumps from other z machine interpreters that I had collected over the years. I'll poke around later. I have a few Z3 interpreter game dumps. I will have to try this to see if i can get it to load with the F18A interpreter. Thanks. It is entirely possible I am remember incorrectly about the 80 column SC version. Hopefully not I'll look for my MFM drive backups. I used to have all of my Infocom games in emulate files to take advantage of the DSK1 emulation back then. So far I've found the 40 column v1.2 Supercart interpreter, a few 1.1 and 1.2 variants, 1.3, but alas 80 column supercart. The Geneve 80 column interpreter runs from MDOS so it doesn't have the same memory constraints. I'll look some more tonight.